*** add in 60,000 commercial square feet, 150 marina slips and that is A LOT OF TRAFFIC!!! Don’t assume Port Marigny is a “done deal,” or that your elected officials & the Planning and Zoning Committee are aware of your concerns. 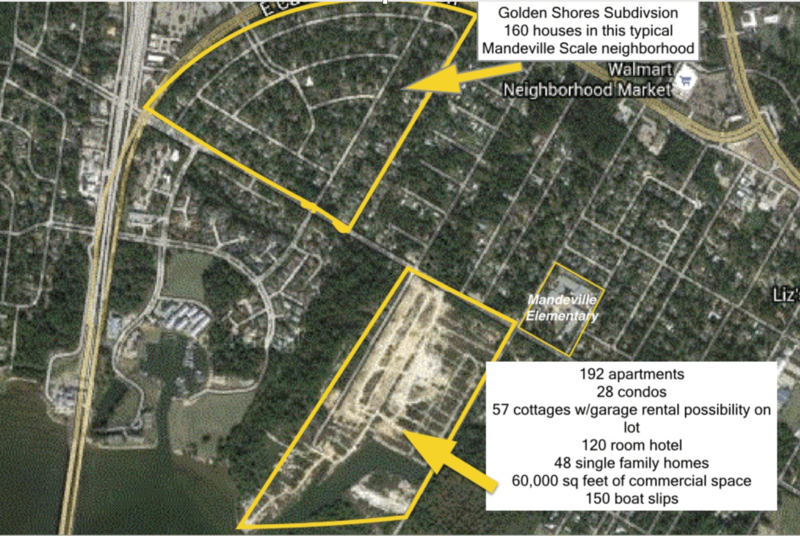 The City of Mandeville runs at a surplus – we do not need the tax revenue from Part Marigny. Did you know that taking people’s personal property (your neighbors), to help alleviate traffic that will result from this development, is a part of the traffic solution being discussed? THERE IS AN ELECTION COMING UP! IF YOU DON’T ASK QUESTIONS OR VOICE YOUR OPINION NOW – YOR ELECTED OFFICIALS WILL NOT KNOW HOW TO VOTE! ***Removing garage apartments has been discussed, however at this time I have not seen that in writing. Greta, adding *(fair estimate)* next to your figures does not make it so. According to the census 2.47 is Mandeville’s average per household 1060/12,236= 8.6% increase in the City of Mandeville. The districts will be redrawn. There are national numbers, local number and census numbers. I did what I felt was a fair estimate based on real life. During the Marigny presentation process, a lot of numbers and even an animation showing how traffic currently flows, made absolutely no sense when applied to real life. So in this case, I’m entitled to give my own fair estimates. I appreciate your input and opinion, though.